We know many folks are knife collectors and have been collecting ranges of knives over the years. When it comes to restoring dull knives, it’s either a nightmare or an easy task. It depends on the skills and sharpening system you use. 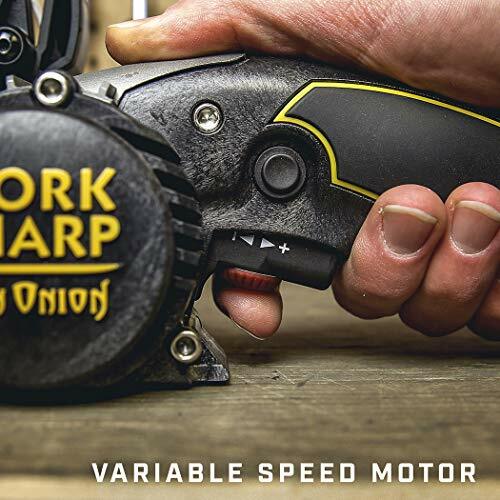 The Work Sharp Ken Onion Edition is the most powerful and versatile sharpener. Click on the image to check lowest price. We’ve seen many different brands of sharpeners available but nothing can beat the Work Sharp Knife & Tool Sharpener Ken Onion Edition. The solid structure and versatility made it a must-have choice for knife enthusiasts. Short on time? Please check the reviews and price here. Here is a tad review about Work Sharp Ken Onion Edition showing the worth of its value. Ken Onion Edition received more than 2000 reviews on Amazon. With the above-combined features, you can sharpen various ranges of blades from straight blades to curved ones, filet knives, tanto blades, serrated knives, gut hooks and any other shape of knife blade. You can sharpen all your knives along with your axes, garden shears, shovels and scissors with this high-quality sharpening system. The five abrasive belts are useful for certain purposes. The P120 Extra Coarse belt and X65 are used to repair damaged blades and other cutting tools. Medium belt (X22) is just used for the general knife sharpening task. Fine belt (X4) is added for quick touch-ups on tools which were recently sharpened. Extra fine belt (6000) is good for polishing the knife for a razor-sharp edge as well as serrated knives. Ken Onion Edition is the only model with a wide range of adjustable angle guides. The adjustable angle guides from 15 to 30-degree with 1-degree increment, is one of the key features to sharpen knives according to its bevel. As a knife enthusiast, you’ll probably know the bevel angle of your knives before adjustment. If you need a reference anytime, refer back to the user’s guide. Most of the Work Sharp Knife Sharpeners have angle guides included. As a general rule, select 20 to 25 degree for hunting and utility knives and 15 degree for kitchen knives. 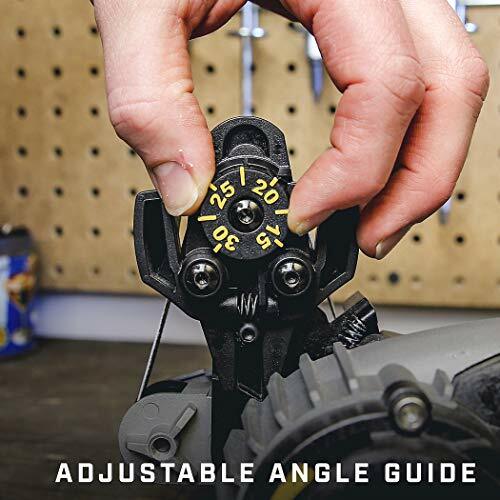 The guide for adjusting the angle is extremely helpful for beginners. To sharpen a knife quickly, rest the blade close to the angle guide and make a few passes on each slot. The sharpening guide is easily detachable if you need freehand sharpening. For those who prefer a fixed-angle guide multi-stage sharpener, check out the list of electric knife sharpeners here. The only model with variable speed control. Motor speed can be varied by adjusting the speed control knob on the trigger button. However, this feature is more for advanced users who want to have more control over the entire sharpening process. This feature is best used together with different abrasive belts from coarse to ultra-fine sharpening. The mechanism for slow speed sharpening is particularly useful for polishing the blade. While sharpening the blades, the sharpener is not terribly noisy but there are sparks if the coarsest grinding is combined with high-speed setting. It can sharpen anything from a lying scissor in your kitchen to a lawnmower blade. There is a power lock switch on top of the trigger switch. It enables continuous running of the motor without the need to hold on to the trigger switch. It may seem handy but be aware of the safety issue if the motor is running without you physically controlling it. 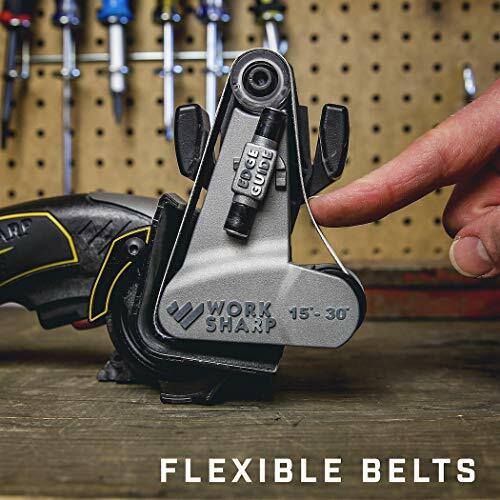 The position of the sharpening cassette is adjustable just like the original Work Sharp Knife & Tool Sharpener to sharpen different types of blades other than the knives. This cassette can be removed to ease cleaning and to swap the attachments for other sharpening purposes. There is also an edge guide on the cassette to rest the knife when the blade is pulled across the belt. This feature may or may not be useful depending on your skill. But it is not a big problem since it can keep aside when not in use. In just a few minutes you can turn an ordinary knife into a dangerous weapon and bleed easier than you think. Read the user’s guide before conducting an experiment on this sharpener. Take it seriously, read the instructions again and again so you can understand how to safely operate this machine! Multi-purpose knife and tool sharpener. 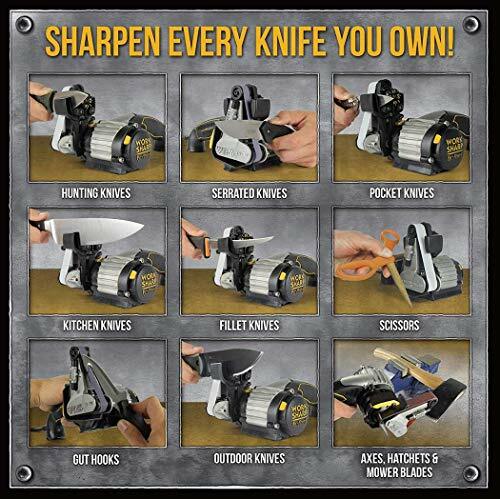 The only sharpener you need to restore any types of knife blades. Also, watch the DVD that comes with it. It provides instructions and optimization tips to get the most out of this sharpener. The Ken Onion Edition Knife Sharpener is operational out of the box. No assembly required. Powered by an AC plug, it comes with a set of five belts to finish your job. For dull knives, we would recommend using the coarse belt first. The coarse belt is selectively used to restore dull knives. It is common to see sparks if the motor is running at high speed. To start your sharpening process you must set the bevel edge angle by turning the adjustable sharpening guide. Then set the motor speed to medium (do not start off with high speed) by adjusting the variable speed dial and place the blade on the belt with the help of the sharpening guide. Then pull the trigger and wait for the magic to happen. The recommended pull rate is 1 inch per second. Keep the knife perpendicular to the belt and when the tip reaches the center of the belt quickly release the trigger. Do not draw the point past the centerline as this will eventually end up rounding your blade rather than sharpening it. Don’t ever forget to keep your hands on work since this is not an automated machine. If you want to lock the trigger then pull the trigger and push the lock-on trigger button. But this is not recommended unless you’re fully aware of the safety issue and is already an experienced user. However, the power lockout switch will come in handy with the blade and tool grinding attachments. For a beginner, make use of the sharpening guide to quickly sharpen the blade. With 5 to 10 passes on each slot, you’re ready to switch belt for medium grinding. It is common to swap a few belts from coarse to extra-fine in order to get razor-sharp knives. The finest grid belt is always the last to change for polishing once a burr is detected. Belt replacement is easy and quick by pulling the belt change lever. Well, to be honest, it will take some time to master this tool and this is definitely not a five minutes job. For a first-timer, you may need to take out some of the cheapest knives to practice enough before putting the expensive ones on this machine. For its price, we bet that you have enough patience to carry out the task. Overall if you’re looking for a stupid crazy bragging sharpener then let us assure you that it is achievable with enough practice. Remember to keep your tools clean after using. Since this product is particularly worth its value, don’t leave it hanging and wait for the work to be over. Try to clean the unit with some dry bristle brush or air compressor nozzles. The Ken Onion Edition comes with a lot of advantages over its disadvantages. The motor is a powerful beast which has the ability to handle almost any job on its own. Lightweight and portable, suitable for beginners and advanced users alike. The sharpening abilities are better than many sharpeners and it’s the most versatile knife sharpener on the market. It can sharpen all types of knives and blades. Sharpened blades have stronger and durable edge due to the convex grind as opposed to the conventional V-shaped edge. The most useful features are the adjustable angles and the variable motor speed control. Comes with five different abrasive belts from coarse to ultra-fine. The belt switching is particularly easy with a press of a button. A perfect gift for huntsmen, knife enthusiasts, and fishermen to make their day. Option to expand sharpening capabilities with optional attachments. The only drawback in our opinion is the price for certain customers. The price is not a deal breaker if you’re a knife enthusiast. Keeping that aside, this product just keeps on getting better. Thousands of customers have been praising its capabilities and are completely satisfied with its functions. Practice makes perfect. Knife sharpening is a matter of speed, accuracy, patience, and skills. This needs practice and practice is not a lesson that can be learned in one to two days. We recommend you look up for videos on YouTube and work the magic you need. It will save you a lot of time from the hassle of doing it without prior knowledge. The experience from the professionals will shorten your learning curve. But for now, we’ve something to share. Do not apply pressure to the knife on the belt as it will push away the spring-loaded guide, thus resulting in inconsistent angle. Sharpen serrated blade is either a simple task to get it done right or ruin it in a minute. Simply switch to the finest belt and only sharpen the flat side of the blade vertically against the belt until no burr remains on the flat side. Do not sharpen the bevel edge as it will make it worst. Sharpen scissors is just the opposite of the serrated blade. Also using the finest belt, avoid touching the flat side and only sharpen the bevel edge. Place the scissors into the scissor guide and pull a few times per side. Check that no burr remains before testing it out with a piece of paper. Also, use the edge guide for the long knife to rest the blade during sharpening. Pull the knife and follow the contour of the edge to ensure the entire edge is evenly sharpened, especially for curved knife. For other blades on different tools such as axes, shovels, and machetes it requires a different approach. Use the extra coarse belt and highest motor speed setting, remove the sharpening guide and swivel the sharpening cassette by pressing the cassette lock lever. This is freehand sharpening and requires extra care to operate safely, expect sparks from high-speed grinding. Make sure there are no flammable liquids or materials in the vicinity before operating. Always make sure the work area should be kept clean before conducting the any sharpening task. This is the bare minimum requirement to avoid injury. Try not to expose the power tools to watery conditions since they can abuse the chord and shock the system as well as the user. You may want to consider the two types of optional attachments for different purposes – The blade grinding attachment and the tool grinding attachment. With the Blade Grinding Attachment, you literally transform the Ken Onion Edition to a larger belt sander machine, similar to the bench grinder. It sharpens larger tools using wider belts, make a knife from scratch, and have more freedom of sharpening to achieve the desired results. The Tool Grinding Attachment will transform it into a powerful handheld belt sander or use it as a file for a wide range of grinding tasks. Who is the Ken Onion Edition for? We’d say that this sharpening machine is for everyone ranging from knife enthusiasts to ordinary working people. If you are a huntsman and need something to set and sharpen your blades then this product is a Godsend for your work. Such an awesome combination of tools and attachments can work for anyone and everyone. The convenience of this professional tool is amazing and it can even fit in a small drawer if you’re living in a small apartment. It is a perfect gift for a craftsman who can craft almost anything with this beauty sharpener. With all these features built-in, this model is a must-have for all knife enthusiasts. 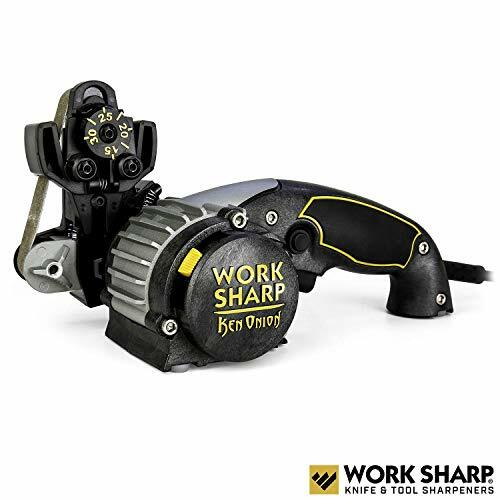 Still debating whether it is a wise investment to get this power sharpener in your collection? We recommend to check the thousands of reviews on Amazon and see for yourself its worthiness before you decide to buy one. Based on years of positive feedback, many are insanely grateful for its existence. After checking numerous electric knife sharpeners we’d swore that this is the best sharpening system you can get since it can meet any level of expectation you want it to. We know that the price can be a bit heavy for customers who cannot manage to afford something expensive for sharpening their tools, but this is a matter of investment and only a one-off investment for the long haul. This is the best sharpener on the market which can make you go from huh to wow! All in all, it’ll make your knives and tools look from boring to amazing in just a few minutes. It looks stylish and meets the ideal requirements. Try out the Work Sharp Ken Onion for yourself if you don’t believe the thousands of reviews on Amazon. You’ll thank yourself later.